Point of interest. Click for the detail. Meeting Point is Na Příkopě 23, Praha 1. Please arrive at the meeting point 15 minutes early. Latecomers will not be reimbursed. If you chose to be picked up from your hotel, our staff will pick you up at the hotel's reception desk. Anyone who is interested in seeing the gorgeous scenery of České Středohoří (Central Bohemian Uplands) and would also like to visit our neighbouring country, can join us on a trip to the German city of Dresden. Dresden originated as a small fishing village, growing to become a spa and royal residence, to finally become the capital city of Saxony. 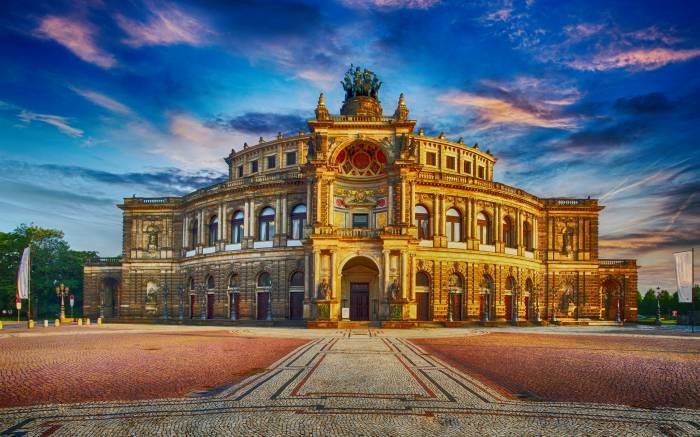 The most important historical monuments are the Zwinger and Albertinum galleries, the Hofkirche and Frauenkirche churches and the Semperoper opera house. During World War II, the city suffered by a massive air raid that almost destroyed it entirely; however, it has been reconstructed and rebuilt. Don’t forget to take your passport with you! The tour can be conducted in 6 languages - English, German, Spanish, Italian, Russian or French. Did you know that because of its charm, Dresden is called Florence on the Elbe? Did you know that the "fire storm" in 1945 killed 2,500 inhabitants and the city was razed to the ground? Did you know that you can find the Zwinger complex here? About us Inspirations Why choose us?